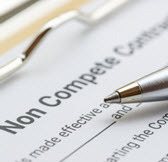 More and more employers are asking employees to sign non-compete agreements. Companies draft these agreements to keep employees from leaving the company, taking all the trade secrets and data they used and work for a competitor. This has happened to many companies, causing profit loss and damages. Companies have a lot of lose in these situations, and they have a strong need to protect themselves. A non-compete agreement accomplished this goal. The downside is that employees want to have the freedom to work with any company they want, and a non-compete agreement restricts this. In fact, non-compete agreements tend to be very restrictive. They often restrict employees from leaving the company and working for a competitor in the same geographic area. This often means that in order to advance their careers, people have to move out of the area and find work there. This can be a real inconvenience. Is there any way around this? Can a person legally get out of a non-compete agreement they signed? A non-compete agreement prevents an employee from practicing in the same specialty or industry as the current employer within a set number of miles for a set period of time. If you take the job anyway, you could be sued for breach of contract. You will then have to pay monetary damages to the employer. Experts claim that talking to the employer and asking them to waive the requirement in your situation is the best policy. You could discuss the situation and explain why the new job will not compete with your current one. You could also propose a deal that would require you to compensate the employer for any lost business. However, this approach is not likely to work, so you’ll want to explore other options. You could also sue your employer, claiming that the non-compete agreement is too restrictive. There have been cases in which an agreement has not complied with state law because it was too overreaching, so this approach is not impossible. In fact, these agreements can only be enforced if they are reasonable. So if you’re close to landing your dream job, and a non-compete agreement is in your way, there are ways to go around it. For future reference, though, don’t sign any document that limits your future employment opportunities. Don’t feel forced into a job. A better position is out there for you. Non-compete agreements benefit employers only. They keep business competitive by preventing employees from working for competitors. Employees often sign them and regret it when they find their dream job with a competitor. If you are a business looking to draft a non-compete agreement or a job seeker who is asked to sign such a document, it’s important to know your legal rights. Seek legal help from Orlando non-compete agreement lawyer B.F. Godfrey from Godfrey Legal. He can help protect your interests. To learn more, contact his office by calling (407) 890-0023 or filling out the online form.